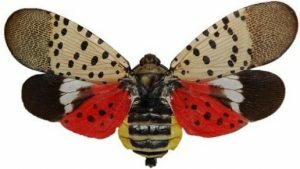 The Spotted Lanternfly is a destructive insect native to Asia that has caused tremendous amounts of damage to crops and ornamental trees since it was first found in Pennsylvania in 2014. From the time of the first sighting of a Lanternfly to now, the populations have exploded. This pest has the ability to breed and increase its population faster than almost any other insect we have encountered in Pennsylvania. A property or municipality can become heavily infested in a very short period of time. The Spotted lanternflies will damage and kill trees and other plants by sucking sap out of the plant. A couple other items that further compound the problem are that the Spotted Lanternfly has no known predators in this part of the world – birds don’t seem to eat them and researchers have not been able to identify any predatory pests that will slow the population growth. They are also very good ‘hitchhikers’. Click on the boxes below to learn more about the Spotted Lanternfly or Contact Us today for a free estimate.